This issue wastes no time kicking up the action as it opens with a grey Hulk bashing some stuff around the Mesa Desert in Nevada. Overhead a helicopter flies nearer and nearer with a curious Sebastian Shaw inside wanting to do some business with the Hulk. They discuss the business on the way over to New York City. Speaking of New York, Spider-Man is doing what he's learned to newly do best and that's stop crime with awesome new powers! He can change the molecular state of anything by just touching it, and yes, that includes webbing up a bomb and turning his webbing to an adamantium box to eat up the explosion. He can even fly now. FLY. Ugh, this all sounds like Superman before 1986...I feel like I've made that joke about this book already. Oh well. Spidey flies home and is having a good night with his wife MJ Watson Parker and some friends before the festivities get cut short. The Hulk has arrived in New York and he's been promised a lot of money by Mr. Shaw, so he's got a job that he intends on completing. Hulk's powers at this point in the Marvel U work kind of strange. Its still Bruce Banner, he can control the Hulk, but he only becomes the Hulk, a grey Hulk, during the night in the moon light. During the day when the sun is out, he becomes Bruce Banner again. And morning hits at a very inconvenient time. Looks like the fight for tonight is over, now we're all just left with a ton of questions. The next night, Hulk and Spider-Man meet up on Roosevelt Island, a deserted place where there aren't any people who can get hurt by the mega brawl...no one except those two damn kids who always sneak out of the house to smoke cigarettes because the plot calls for it...dammit. The fight rages on until Spider-Man finds out about ANOTHER power, he can shoot beams out of his eyes! He super kicks the Hulk straight into space and leaves him in there. The sun is going to be rounding this area of the earth soon and although the Hulk can hold his breath for an extremely long time and survive in space, Bruce Banner can not. This is the end, Spider-Man has killed the Hulk, until Spider-Man single handed flies into space and grabs the Hulk rocketing him back to earth! 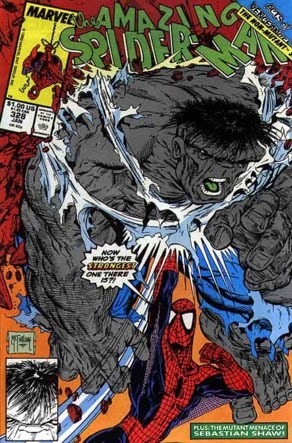 To repay the Web Head for not letting Hulk die out in space, Hulk has agreed to simply, not kill Spider-Man. Well that seems more than fair if you ask me. Banner is captured by Shaw the next morning and flown back to the midwest as a failed attempt to bring down Spider-Man and everyone is left to be happy for another day. This issue felt short, and that's because there was a LOT of action. Tons of panels were taken by Hulk and Spider-Man duking it out, but you know what? I loved it. I love the short fast reads that're packed with action. Those are some of the best comics to read out there, sometimes. Not mindless violence, story driven violence at least. Well there's just one more issue left in the McFarlane/Michelinie Omnibus and what a journey it's been. Be back in a week to see how this almost year long adventure wraps up!